On November 2nd, Rosanne Cash will release her first new album in nearly five years, She Remembers Everything. The poetic, personal and incisive collection features ten songs, all written or co-written by Cash, that reckon with a flawed and fragile world from a uniquely feminine perspective. Recorded in Portland, OR and New York City, with Tucker Martine and John Leventhal respectively, and featuring contributions from Elvis Costello, Kris Kristofferson, Colin Meloy, and Sam Phillips, She Remembers Everything follows Rosanne’s triple-Grammy winning 2014 album The River & the Thread (Blue Note), and marks a return to more personal songwriting after a trio of albums that explored her heritage. To accompany the announcement, Rosanne has released two songs from ‘She Remembers Everything;’ the haunting title track, and “Everyone But Me,” an exquisite mosaic of generational grief and reckoning. Listen to “She Remembers Everything” and “Everyone But Me”. In addition to the ten-song release, a deluxe version of She Remembers Everything with three bonus tracks will be released digitally and as a limited edition casebound book CD. 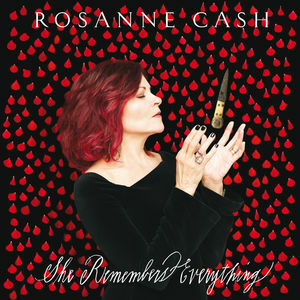 Fans will also have the option to purchase a limited edition box set entitled the She Remembers Everything Memory Box, which will include personal letters of correspondence signed by Rosanne, and exchanged between her and T-Bone Burnett, Elvis Costello, Sam Phillips, Joe Henry, Tucker Martine, and John Leventhal; an exclusive Rosanne Cash Live at SFJAZZ CD, recorded in 2017 and featuring Emmylou Harris and Lucinda Williams; She Remembers Everything pressed to pink vinyl; the deluxe casebound CD with three extra tracks; and a digital download redemption card. The box will also include a copy of ‘Bird On A Blade’ (UT Press), a new book of lyrics and illustration by Rosanne Cash and Dan Rizzie, along with an 8” x 10” printed lithograph featuring an original Rizzie illustration from the book. The announcement of She Remembers Everything caps an already busy year for Rosanne in which she debuted new songs at Lincoln Center from a forthcoming original musical about the life of Norma Rae (a story of union organizing and a woman’s transformation in 1970’s North Carolina), performed a program of her father’s music with Ry Cooder at SFJAZZ where she is an artist in residence, received an honorary doctorate from the Berklee College of Music, executive produced (with Steven Soderbergh and Errol Morris) the acclaimed documentary film ‘The King,’ and just last week earned the “Spirit of Americana” Free Speech Award at the Americana Honors and Awards in Nashville for her activism on behalf of artists’ rights and gun control, among other worthy causes.